Oh Lordy, the interwebs were buzzing with sightings of ~Anthony Bourdain~ last week, who was in town shooting his new show, The Layover. Plenty of his own tweets shared where he went: Chaac Mool in Dolores Park, Toronado, Li Po, Comstock Saloon, Mr. Bing’s, Sam’s Burgers (oooh, that must have been a late night), Swan Oyster Depot, Molinari’s (for a “breakfast hero,” oy), and a jump into the pool at the Tonga Room. Sarah Han at The Bold Italic got a picture with him at the Rice Paper Scissors pop-up, and another tweet revealed he was at Monk’s Kettle. That was some serious tablehopping. 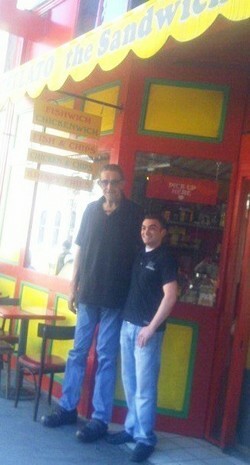 Photo of Peter Mayhew from Macellato/Twitter. I forgot to post this one last week: ~Peter Mayhew~ (aka Chewbacca) reportedly likes the chickenwich at Macellato in North Beach. Last Wednesday evening, the ~Gipsy Kings~ came in to Bluestem Brasserie for dinner; they played at Mountain Winery in Saratoga last Tuesday (they are in the middle of their 2011 World Tour). They sat upstairs on the mezzanine level, ordered several steaks, and enjoyed a family-style dinner.